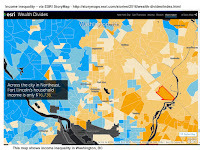 This image is from an ESRI Storymap titled "Wealth Divides" that you can find at this link. 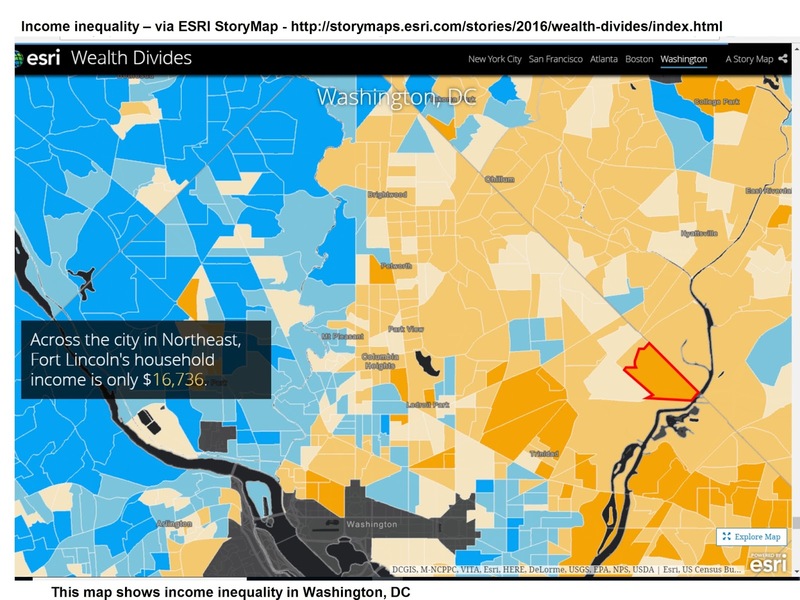 This demonstrates a growing ability to use story maps to build a greater understanding of how some places are blessed with great wealth while others are less fortunate due to great poverty. 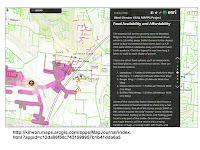 I'll reach out to ESRI, but the next layer of information on maps like this should be borrowed from my own history of building map overlays that show locations of non-school tutor and/or mentoring programs in different neighborhoods, as part of a strategy intended to draw resources to existing programs while helping new programs start where few or none exist. Here's a blog article that illustrates how I've been trying to use maps. Imagine what might result if teams of students, volunteers and map-makers were duplicating the Tutor/Mentor Connection's 4-part strategy, and were producing map stories using current StoryMap tools, to draw attention to inequality, violence and other indicators of need, and were drawing resources to organizations working to reduce those inequalities. That could be happening in every part of the world if a few leaders would step forward to make it happen. 11/30/16 update: Here's a New York Times story about immigration, that uses maps and animation to tell the story in a visual way. 12/20/16 update: Here's another ESRI storymap, this time telling the story of the Dakota Access Pipeline (DAPL). 4/8/2018 update: Mapping Inequality: Redlining in New Deal America - this collection of Home Owners Loan Corporation (HOLA) maps from the 1920s and 1930s serve as "as critical evidence in countless urban studies in the fields of history, sociology, economics, and law. Indeed, more than a half-century of research has shown housing to be for the twentieth century what slavery was to the antebellum period, namely the broad foundation of both American prosperity and racial inequality." 4/24/2018 update: Segregation incarnated in brick and mortar. 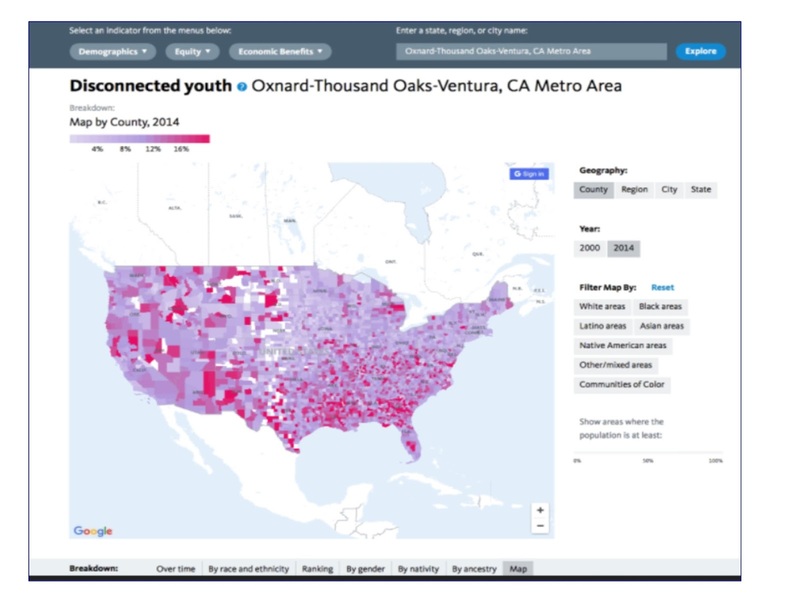 See maps in this April 2018 article on The Hechinger Report. 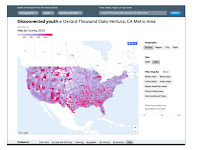 12/11/2018 update: 2018 County Health Map - Key Findings - click here This report is a resource that can be used by leaders from across the USA. 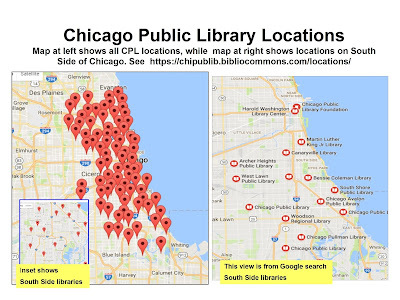 This map shows Chicago public schools with librarians and those without. It's from this article which was written by Anne Li and posted in the South Side Weekly. 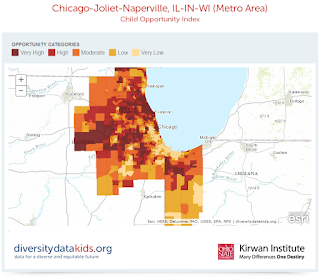 I've been using maps for many years to show areas where kids need extra help, such as non-school tutor and mentor programs, due to living in areas of high poverty. This is just one more example of how kids in affluent areas get greater support and learning opportunities than kids in high poverty, highly segregated areas. 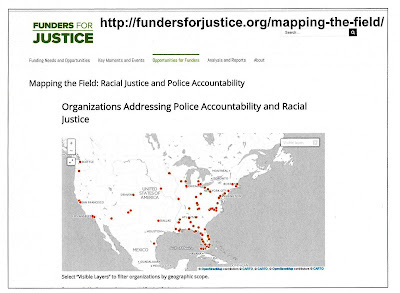 Browse through other articles on this MappingforJustice blog site and see more maps telling this story. 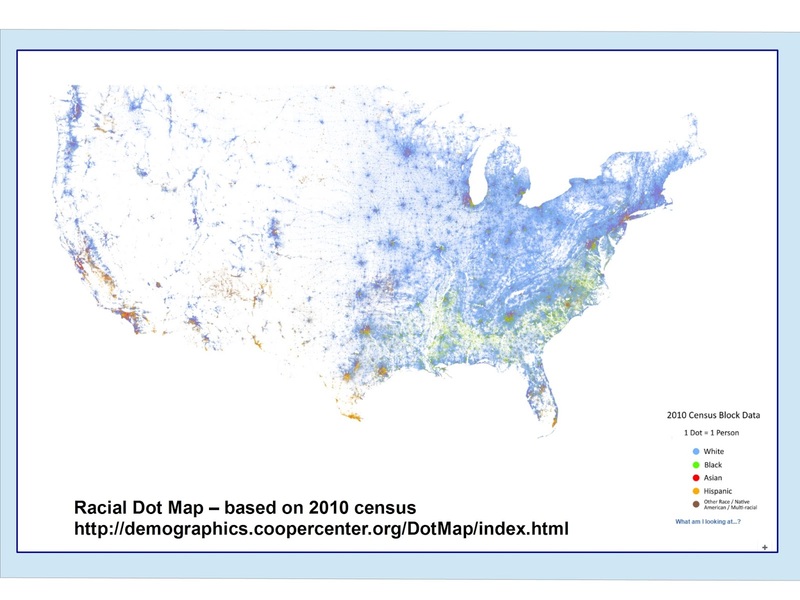 Create your own map story and or blog article and help draw attention to this problem. 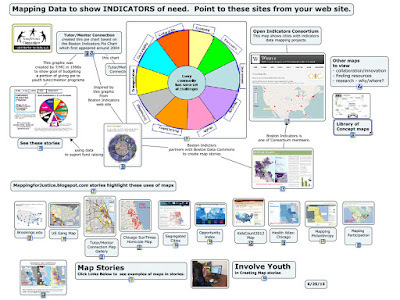 This is a screen shot showing an Opportunity Youth map on Policy Link's National Equity Atlas data platform. I have been listening to webinars for the past year, in which Policy Link shows features on its site and explains how to make your own map. The archive of today's webinar is here and slides are here. While this map view shows the entire United States, the next image shows a close up view of Phoenix. 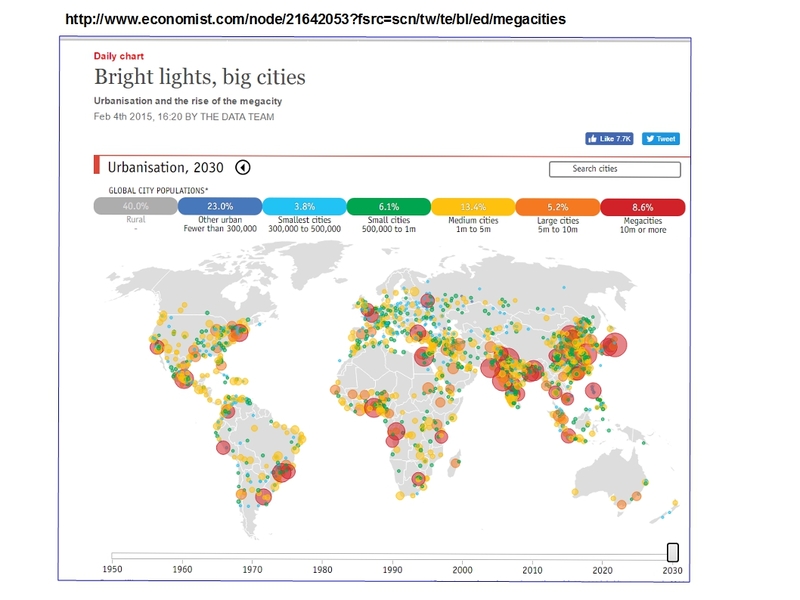 The Equity Atlas has data for the 150 largest cities, so a similar map could be created for Chicago, Dallas, NYC, Detroit, etc. As I watched the webinar my primary concern was "Where is the talent in a city who can create map stories out of this data?" I'd add, "Is there a marketing/PR team, focused on creating on-going map stories that reach people with enough frequency that they begin to respond to what the maps are showing. 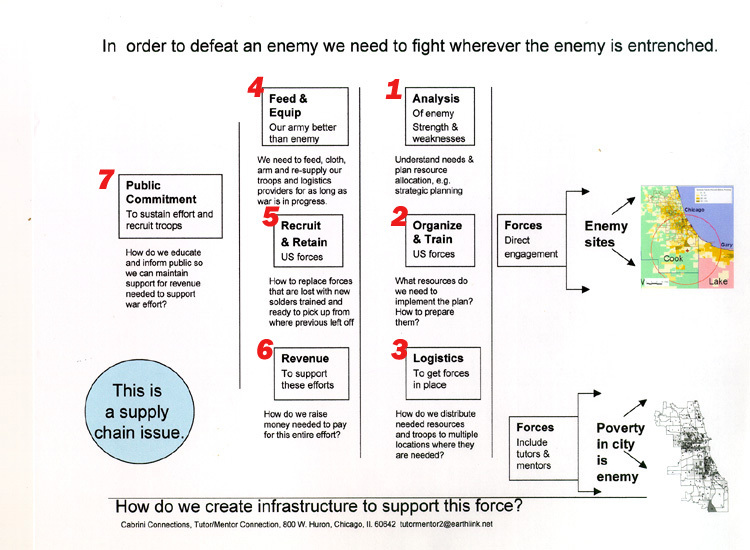 The graphic at the left is just one page out of many in this presentation, that helps people in this suburban community better understand a problem that only has a direct affect on a a small percent of the population, but has an indirect impact on the entire community. 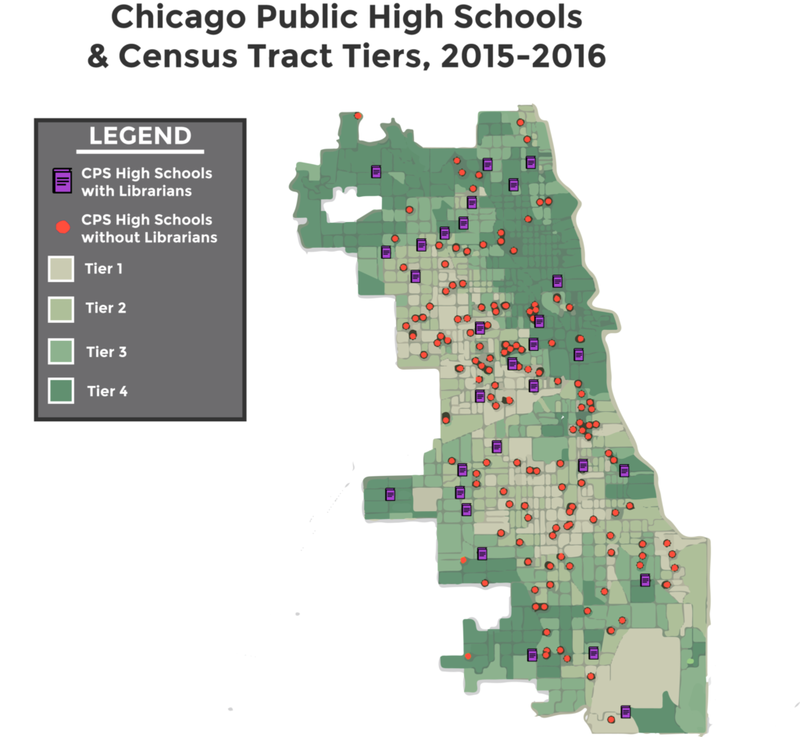 I present these two different uses of maps to illustrate the type of data that is available to leaders and community advocates in Chicago and other places, as well as the ways data can be turned into stories. 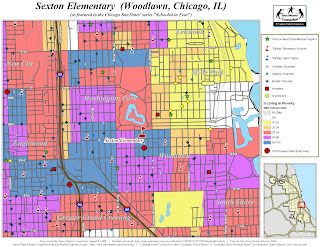 If you browse past articles on this blog, and the Tutor/Mentor blog, you'll see that I have been creating maps for nearly 20 years, with the goal that people use them to fill poverty neighborhoods of Chicago with high quality, non-school tutoring, mentoring and learning programs, along with other supports, that enable more kids living in these areas to move safely through school and into jobs and adult roles. I created this concept map to point to many other data mapping platforms that can be used to create story maps. Here's the link. For this to happen, many people need to be creating story maps, and many others need to be sharing them regularly. That will require leadership from business, universities, foundations and political leaders. If I can help you think this through, lets connect. 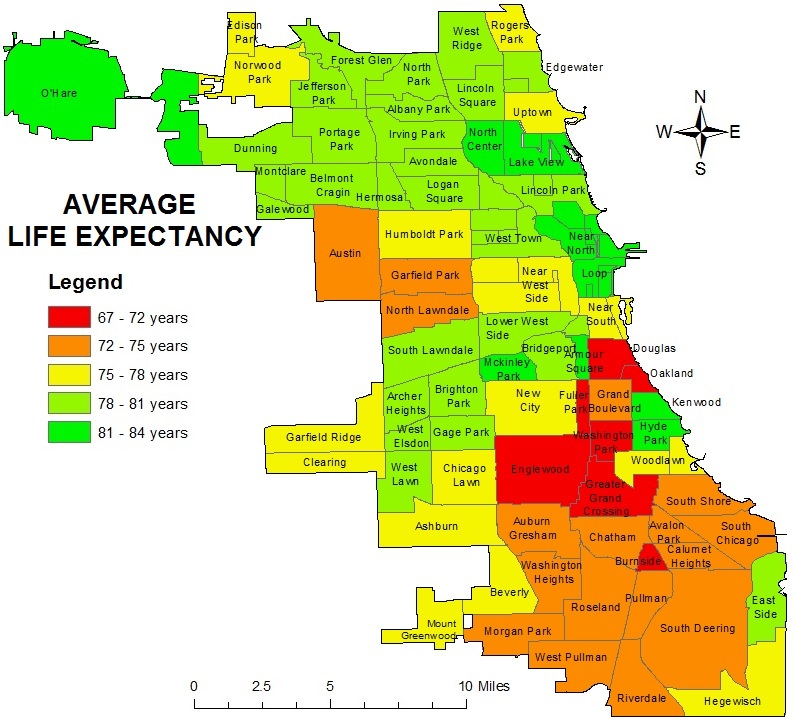 Today I found two articles on the Metropolitan Planning Council web site that focus on crime rates in Chicago and declining population. If you browse articles on this blog, going back to 2008, you'll see that my focus has been on urban poverty and its causes, and on volunteer-based tutor/mentor programs as part of the solutions. Today my Twitter feed included this post. The maps in this post are from a Wall Street Journal article (see link in Tweet) which shows the growth of the drug crisis in America since 1990. 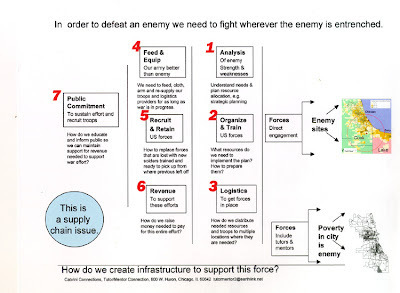 In articles on this blog and the Tutor/Mentor blog I have pointed to this concept map, showing four actions that need to be taking place to help people solve complex problems that they are concerned with. You can find this map here, and it's described in this presentation. While my web library has many articles about poverty, and showing how to use GIS maps, it does not focus on the drug crisis, solution providers, and places where people are interacting and trying to figure out ways to reduce this plague. 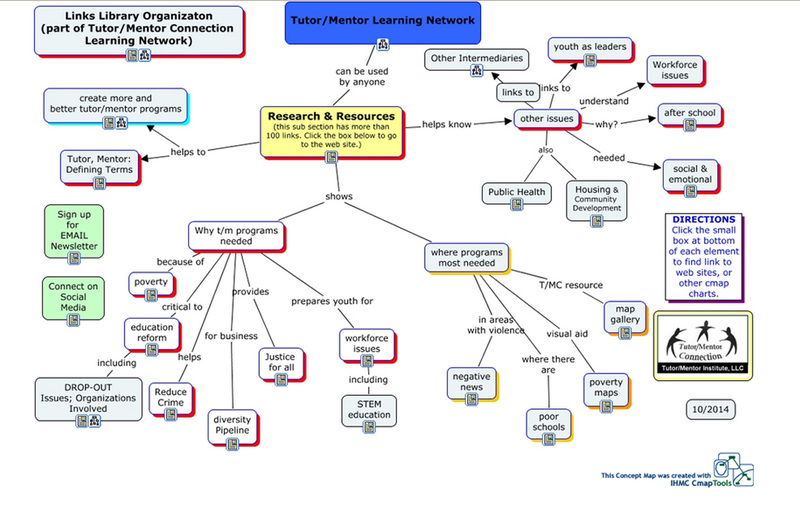 This concept map shows the research sub sections in the Tutor/Mentor web library. 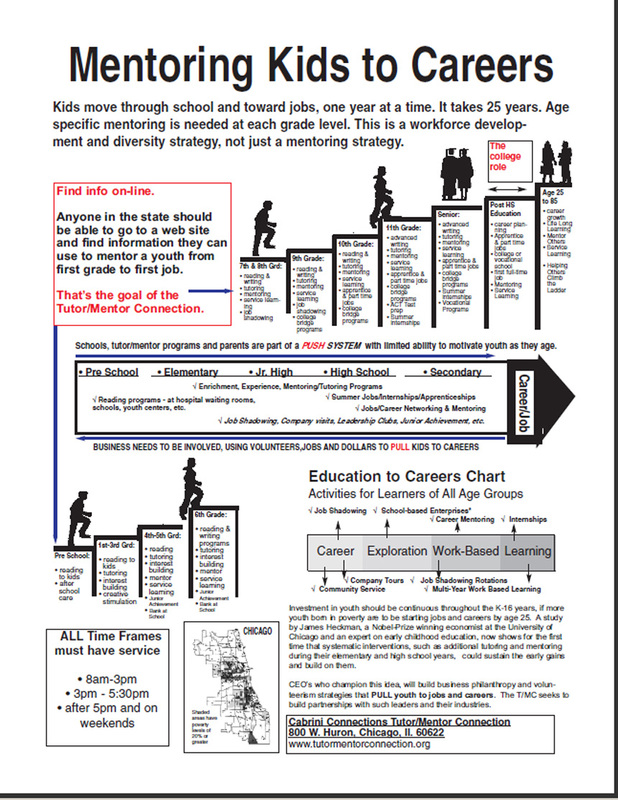 Why are tutor/mentor programs needed? Where are they most needed? If someone has a good web library focused on the drug crisis, with links to other resources beyond their own, share a link with me in the comment section and I'll add another node to this map, pointing to your site(s). I'm sure that as we look at the maps, we'll see that some of the places I've been focusing on will be the same places where drugs are a problem. However, we'll also see many places in smaller cities and towns where this is a huge problem. This graphic shows a process that we need to be going through, in places all over the country. I describe it in this blog article and this presentation. As more communities and organizations begin to organize this process, we can connect with each other in online communities, enabling a sharing of ideas, identification of common problems, and innovation of solutions to solve these problems. Perhaps that common bond will bring more of us together in efforts that find solutions. NOTE: view the comments sections for new articles on this topic that have been discovered since this original post was written. Jan 2017 update: This interactive map shows locations where people died of drug overdoses, and tells stories of who those people were. Feb 27, 2017 update: The Poynter Institute is offering a free one-day workshop in New York on March 3, 2017 (and in other cities after that) to help journalists cover the unfolding story of the Opiod Crisis. Visit the web site for more information and updates. 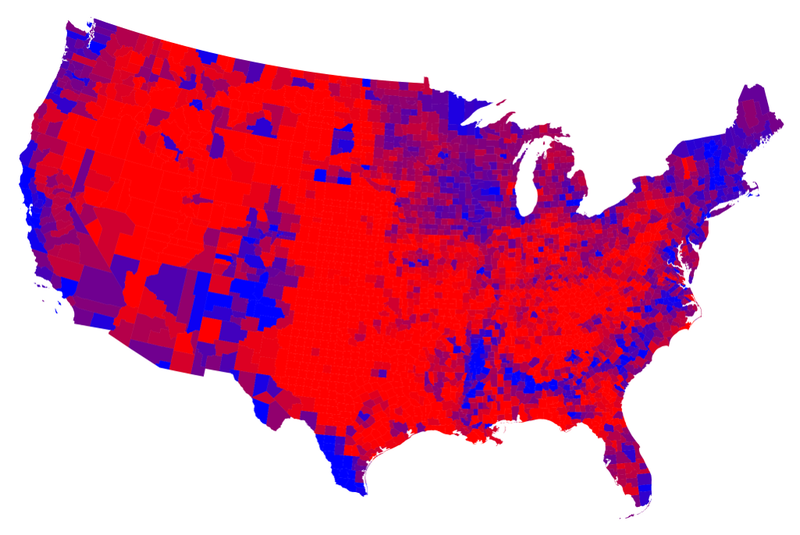 Dec 3, 2017 update - This ESRI map shows mortality rates for every county in the USA. This article talks about the data in the map. 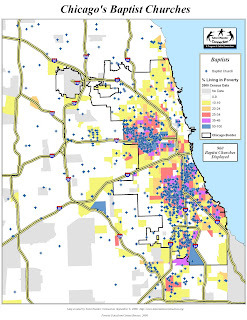 If you browse articles posted on this blog since 2008, and on the Tutor/Mentor Institute blog since 2005, you'll see maps used to show areas of Chicago and other cities where youth and families need a wide range of extra support to help young people move through school and into adult lives free of poverty. In many of these articles I focus on the proactive role that business, philanthropy, hospitals and other anchor organizations can take. In this article I'm going to illustrate this strategy, focusing on libraries and hospitals. I'm using the New York City Public Library system as my example. The map at the right shows locations of New York City Public Libraries. 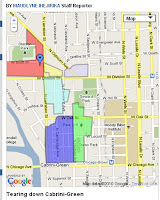 Click here to visit the site and zoom in on the map. As with most cities, libraries are spread throughout the city. 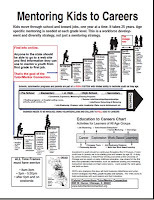 This summer I connected with a New York City organization called IntegrateNYC4me, which engages young people in communication information about school segregation in New York City Public Schools. Here's the Research Page of their web site. 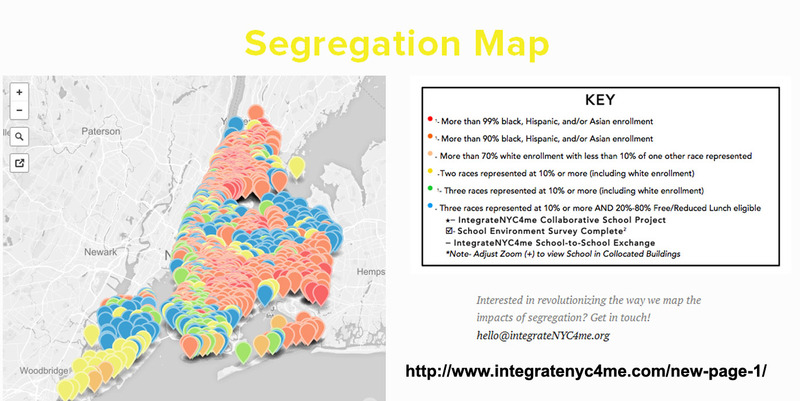 Below is a copy of their map, showing segregated schools in NYC. 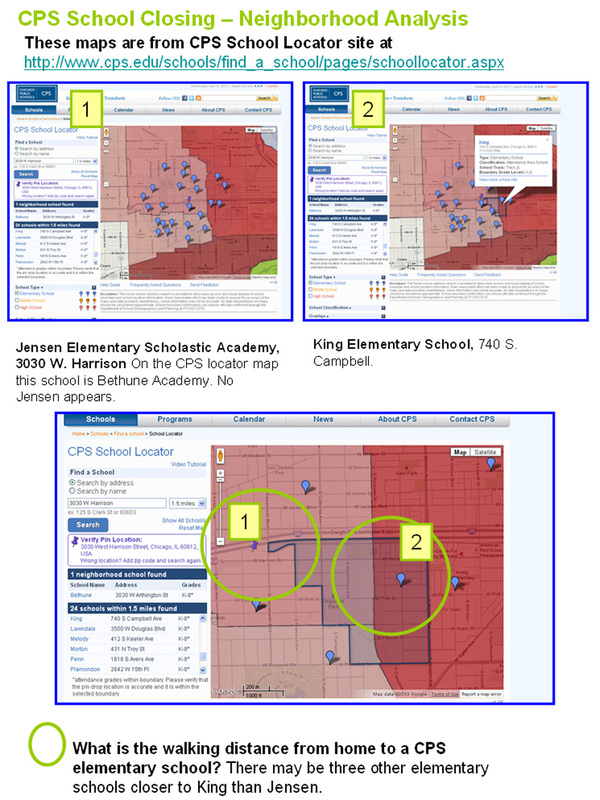 I zoomed in on both maps, focusing on an area where there are a large number of segregated schools. Below are two maps showing the area between 125th St and 175th Street. 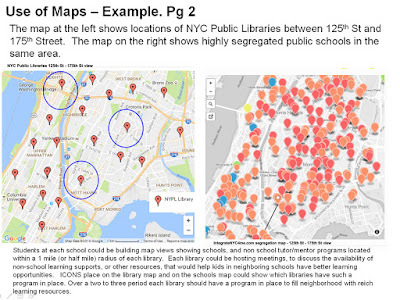 The map on the left s hows libraries in the area and the map on the right shows highly segregated public schools in the same area. Students at each school in this map area could be building map views like this. 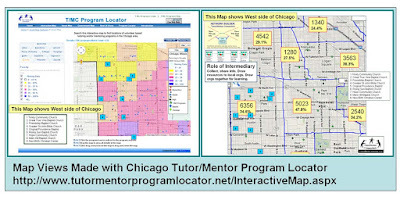 They could do neighborhood research to learn about non school tutor/mentor programs located within a 1 mile (or half mile) radius of each library, then adding that information to the map, as I do with the Chicago Tutor/Mentor Program Locator Interactive map. 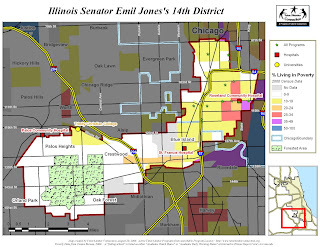 Such maps could also show other assets in the area, such as businesses, banks, faith groups, hospitals, colleges, etc., as well as political leaders who represent the area. This Asset Map section of the Program Locator enables users to build map views showing indicators of need, locations of existing tutor/mentor programs, and assets within the same map-area. (note - the Program Locator has not been funded since 2010, thus serves as a model for this example). Each library could be partnering with youth groups, and volunteers from area businesses and/or colleges, to create maps and share this information, and to host meetings, to discuss the availability of non-school learning supports, or other resources, that would help kids in neighboring schools have better learning opportunities. 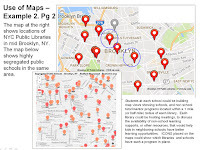 Such meetings can focus on information in the library, that shows the impact of poverty and segregation on the neighborhood and the wider NYC region, as well as information in web libraries like the one created by the T/MC since the early 1990s. ICONS placed on the library map and on the schools map could show which libraries have such a program in place. I put circles on the map above, to illustrate this. Over a two to three period each library should have a program in place to fill the library neighborhood with rich learning resources. 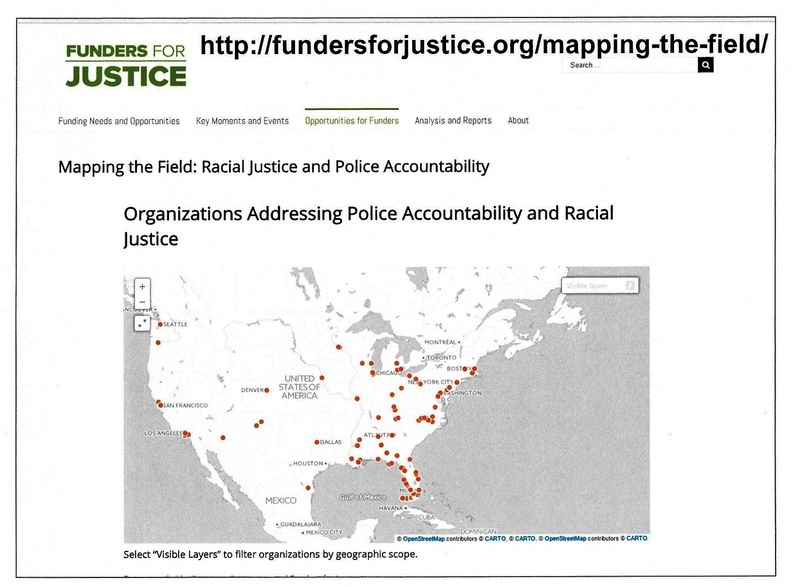 Foundations and government offices should have maps on their own web sites, showing where they are funding and supporting such efforts! 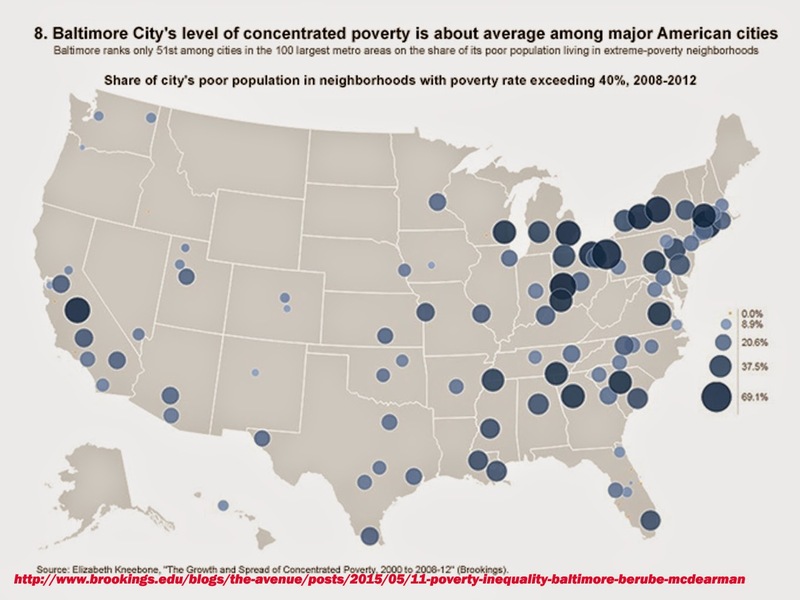 Maps in local media should be showing the growth of these efforts in high poverty areas, just as frequently as they show maps with the number of homicides in a city. Students working with this project could also learn to do evaluation and recognition mapping. 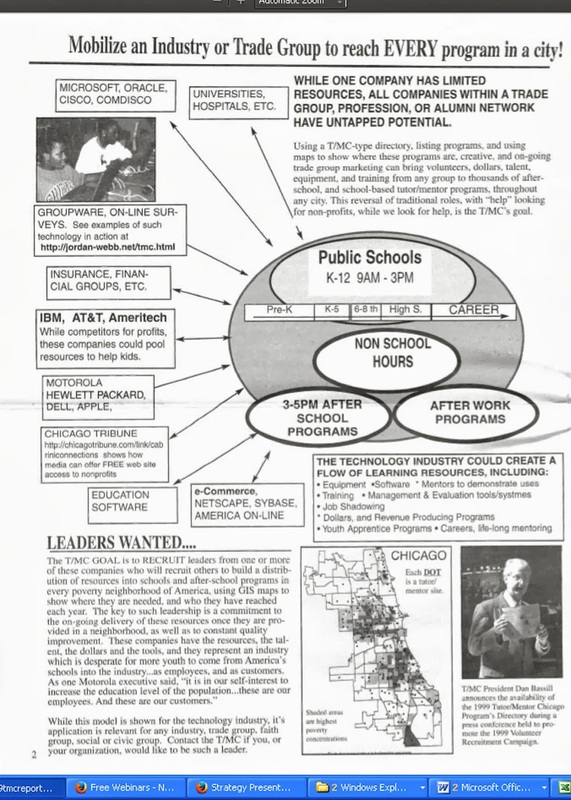 The map at the right shows people who attended a Tutor/Mentor Conference in Chicago, with different icons showing the affiliation of the participant. The goal is that such events bring all of the stake-holders from the map area into on-going efforts that lead to more and better youth serving organizations in the area around every public library that operates in a poverty areas, or one with highly segregated and poorly resourced schools. Putting participation information on the map is one task. Creating blog articles, media stories, podcasts and videos to give positive recognition to those who are involved in this effort is a second set of necessary actions. 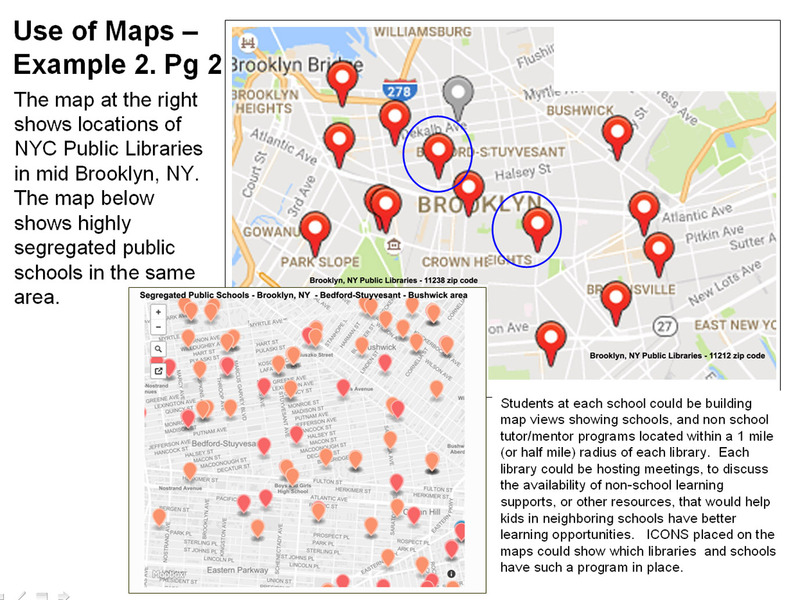 Students, at the high school or college level, even Jr. High School level, could even be writing up process and "how we did it" reports, as part of on-going learning, and could be sharing strategies from one library-neighborhood with others, in NYC and in other cities, via cMOOCs organized around the Connected Learning (#clmooc) format. 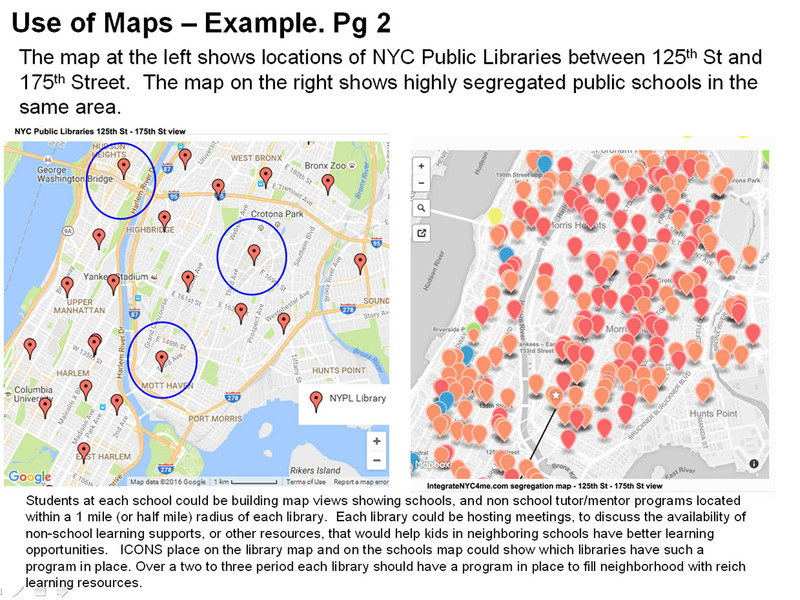 Here are a few more maps that illustrate this thinking: First is a map showing Brooklyn, NY public libraries and segregated schools. 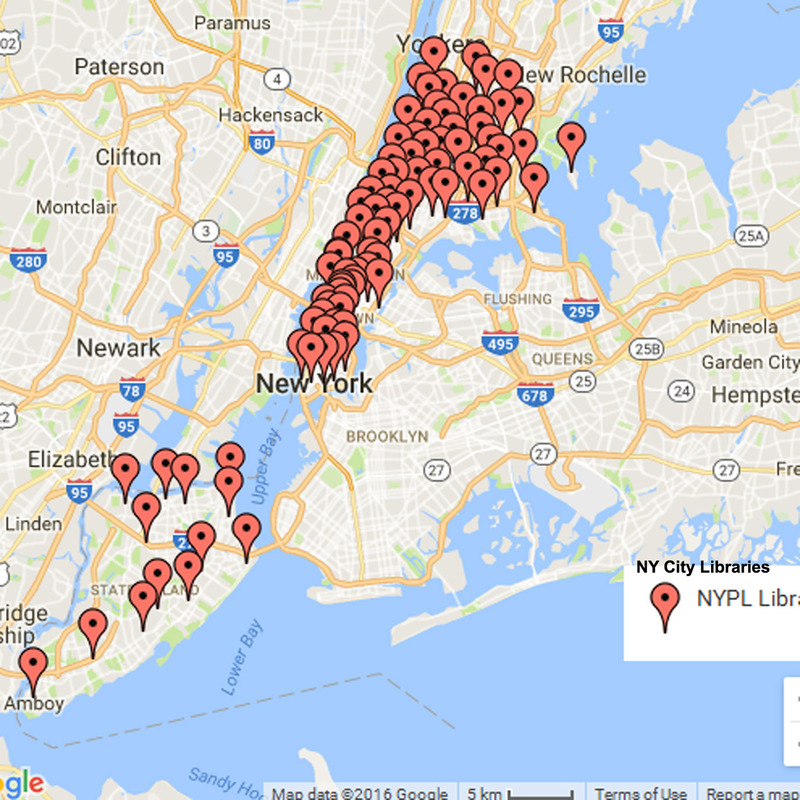 The map of all Brooklyn, NYC libraries can be found here. 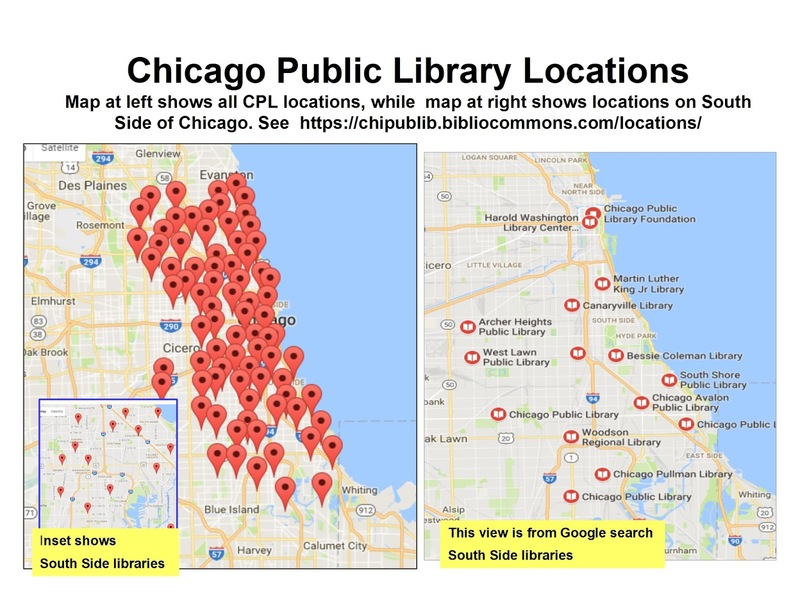 This map shows locations of Chicago Public Libraries, with insets showing libraries on the South Side of Chicago. The same process I describe for NYC could be taking place in Chicago and every other city with areas of highly concentrated, segregated poverty. 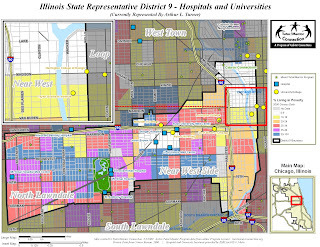 The map below shows the location of Sinai Hospital, on Chicago's West side, within the 9th Illinois State Representative District. It's from a series of stories written in 2009 to show the role this hospital, or others in the map-area, could take to help mentor-rich programs grow in the areas surrounding it. 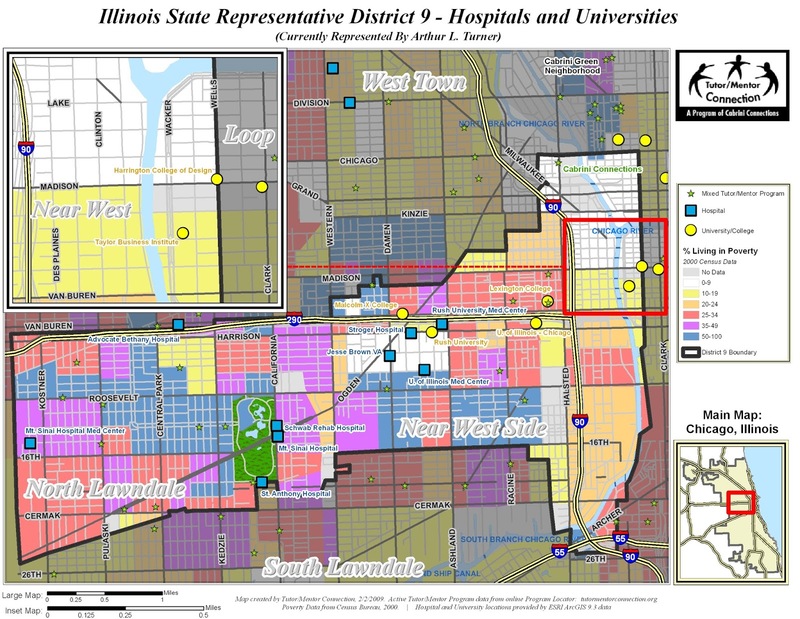 Another article showing Sinai Hospital, and a strategy that can fill the surrounding neighborhood with mentor-rich programs, can be found here. 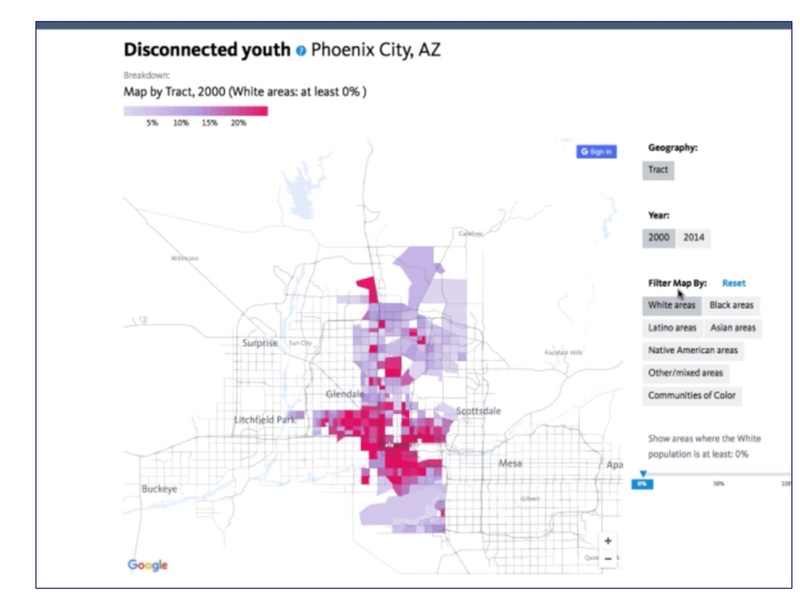 An article showing how youth could use maps in stories following media coverage of violence in a neighborhood, can be found here. Anyone can duplicate the stories I write. Most can do it better! Do it! 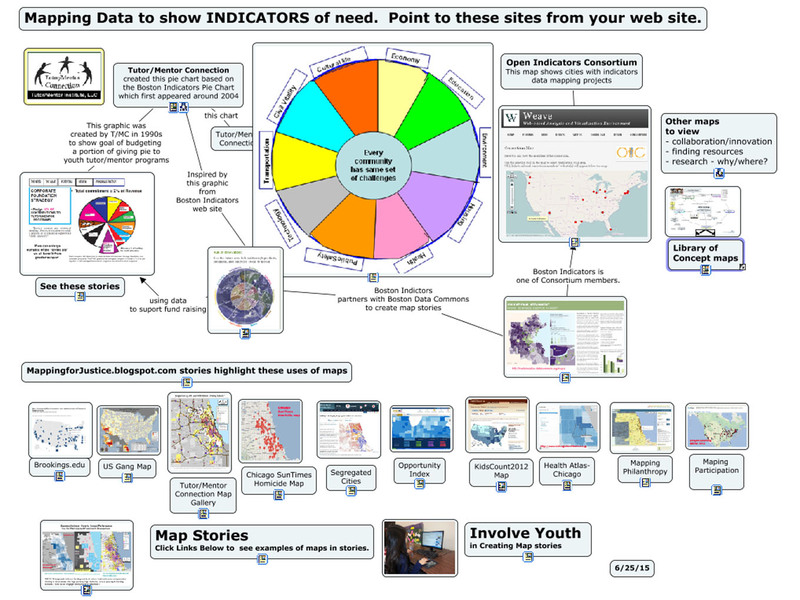 Teams of youth and volunteers, working with modern GIS technologies, can create similar map collections, showing indicators of need for extra help, and showing organizations already operating in the map-area, offering various forms of help, and showing assets who could be providing more consistent help, since they also are part of the map-area. 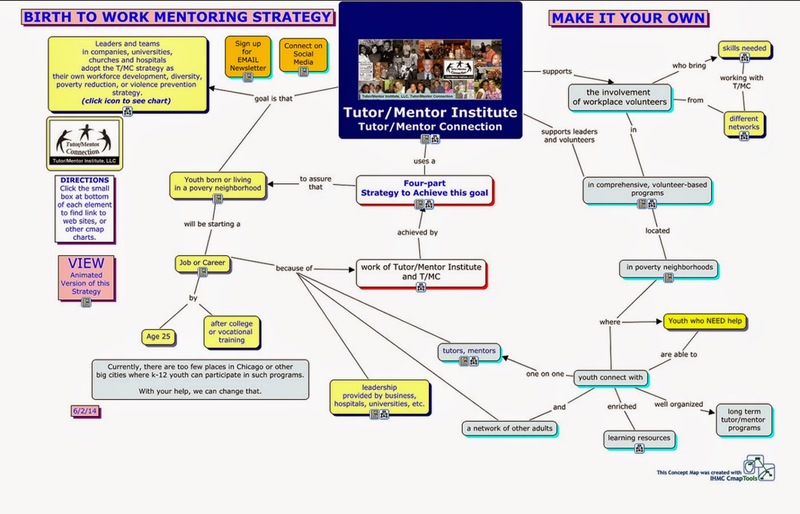 This presentation shows how to use platforms like the Tutor/Mentor Program Locator, to create your own map stories. 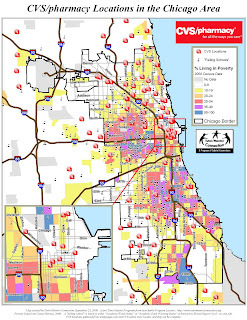 Maps created by the Tutor/Mentor Connection from 1994-2011, do not focus on libraries, police stations, fire stations or other anchor organizations, but these are all institutions spread throughout a city, which could be leading community mapping and mobilization efforts intending to make their district the safest and best place to live, work and raise families. If you'd like to explore these ideas further, let's connect. If you're already doing this, share your blog or web site address in the comment section below or on Twitter or Facebook. If you'd like to sponsor the Program Locator and help the Tutor/Mentor Institute, LLC rebuild it's mapping capacity, visit this page. This set of maps shows that half of the students who are chronically absent from school are concentrated in just 4% of school districts. 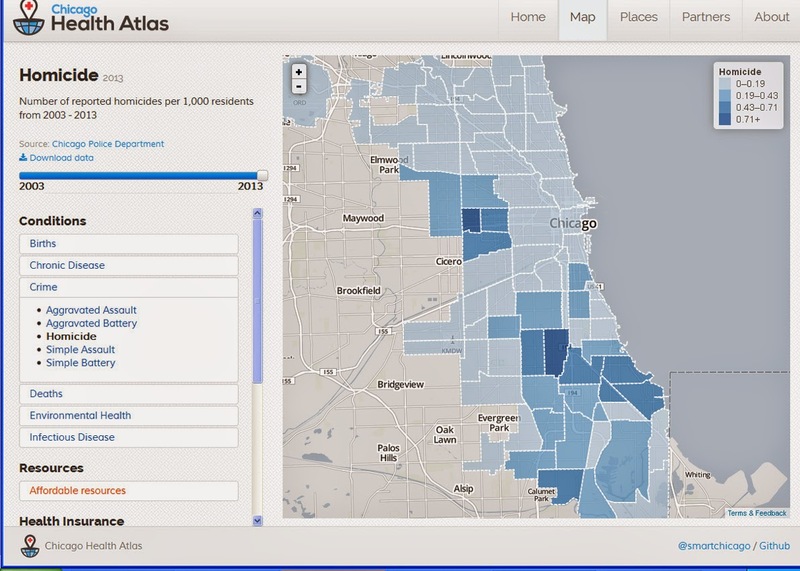 Click on the tab for "High Minority High Poverty Urban School Districts" and you'll see that Chicago is included. In past articles I've emphasized how big cities have unique challenges and opportunities and we should be connecting in on-line forums, blogs, Twitter chats, etc. to share ideas and innovate ways to generate the public will and flow of resources needed. This map image comes from the diversity.data.kids.org web site and shows the child opportunity index for the Chicago region. 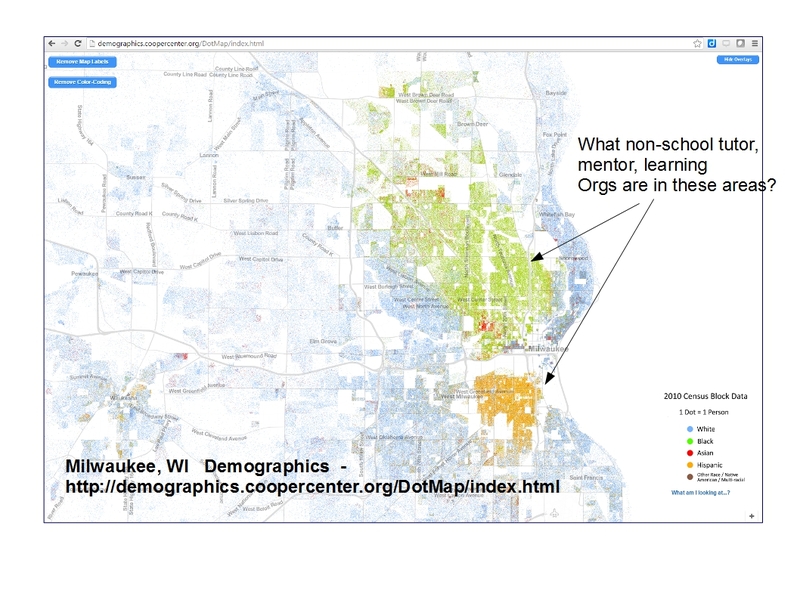 The lighter colored areas are neighborhoods where youth have less opportunities than in other places. These are areas where non-school, volunteer-based tutoring, mentoring and learning organizations are most needed, along with many other poverty reduction solutions. A nice feature of this site is that you can create a map view of Chicago, Boston or another city, then save it as a jpg, using a feature built into the site. Then you can include the image in a blog like I've done here. It's another example of how maps can be used to focus attention, and resources, on all of the high-needs areas of a big city like Chicago. In today's scan of the Internet I found this article on the web site of the National Committee for Responsive Philanthropy. It's titled, "Four Steps Foundations Should Take to Address Racial Equity". In Step 1 they point to the map shown below, which you can find at this link. 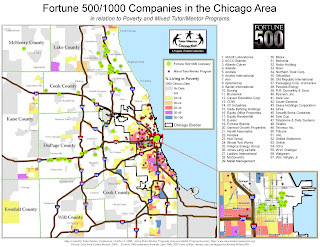 In other articles about philanthropy on this blog, and in the Tutor/Mentor blog, I've focused on the need to invest on-going funds in building strong organizations serving youth and families in high poverty, high minority, neighborhoods. I've encouraged funders to create maps like this, showing organizations doing needed work, and showing who is being funded. The map above is one of two on the site. If you're a Black-led organization and not yet on the map, click here, to introduce yourself and be added to the map. I've been building a map-based directory for over 20 years and understand how difficult it is to gather the information, and keep it updated from year to year. 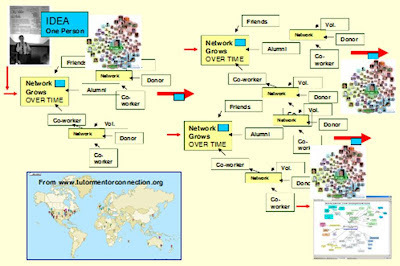 It takes the active involvement of organizations seeking funds, as well as those providing funds, and the intermediary who builds and manages the map. Below is a Letter to the Editor that I wrote to the Chronicle of Philanthropy in 1998. No foundation stepped forward to provide the support I was asking for, but the need still exists. Browse past articles on this blog, and on the Tutor/Mentor blog to see how I've been using maps, which is how leaders from any city, and every sector could also be using maps. 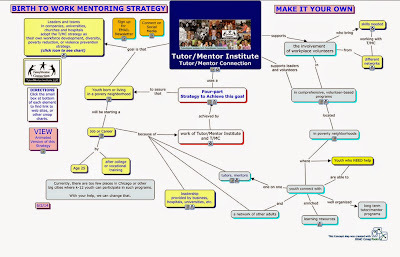 Read this section of the Tutor/Mentor Institute, LLC Planning Wiki to see what my goal for using G IS maps has been since 1993. 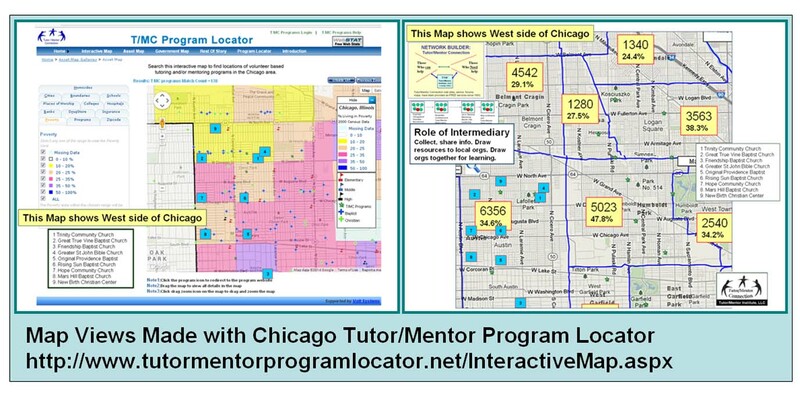 Read this section to see what the Chicago Tutor/Mentor Program Locator is intended to do, and to see challenges it's currently facing. Then read this section to see a vision for using the Program Locator as a crowd-funding platform. This can all be kept available in Chicago, or made available in any other city, if an investor/benefactor and/or partner will come forward to help. Today I read this report on the Better Government Association web site, titled "CHA's Transformation Reshaped a City". It shows while the displacement of public housing residents led to gentrification in some neighborhoods, which had a positive impact on CHA residents who were able to obtain vouchers and live in these areas, most of the benefit went to those moving in, and less went to the poor people who most often moved into other neighborhoods which already held concentrations of poverty. 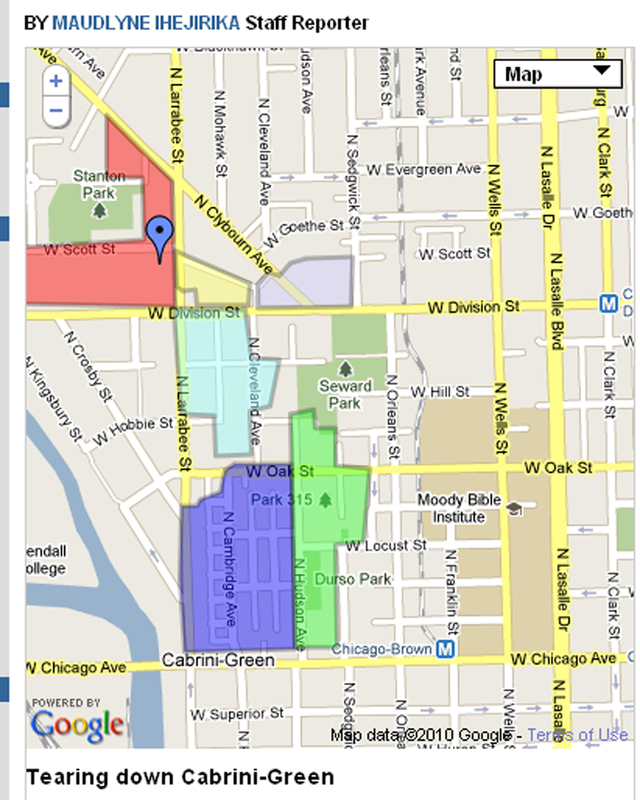 In 2010 I included the map of Cabrini-Green (shown above) in this blog article, under the title, "Cabrini-Green gone. Are you sure?" The BGA article includes a statement that 3200 families now live in Chicago's Near North area. If families average 3 children per family, that would mean there are at least 9,000 low-income kids hidden in this area and I'm not aware of a lot of non-school tutor/mentor programs still there to help them. Maybe they don't need as much help since affluent families tend to support schools with better trained teachers and more learning opportunities. That benefits poor kids, too. In January I created a new map showing locations of the youth serving organizations in my database. If you set my map next to the map in the BGA article, you can begin to determine what level of non-school, volunteer-based tutoring, mentoring and learning programs are available in areas where former CHA residents have been moving. This is an analysis that should include business, political, government, religious, university, CPS, media and residents, with neighborhood groups focusing attention on each of the high poverty community areas. It's something that should be funded by the major foundations, or by the city, or the CHA. The result should be the growth of more and better services to youth and families in the high poverty areas where former CHA residents live, as well as the development of needed programs in the areas where poor people are living mixed in with people of more affluent backgrounds.